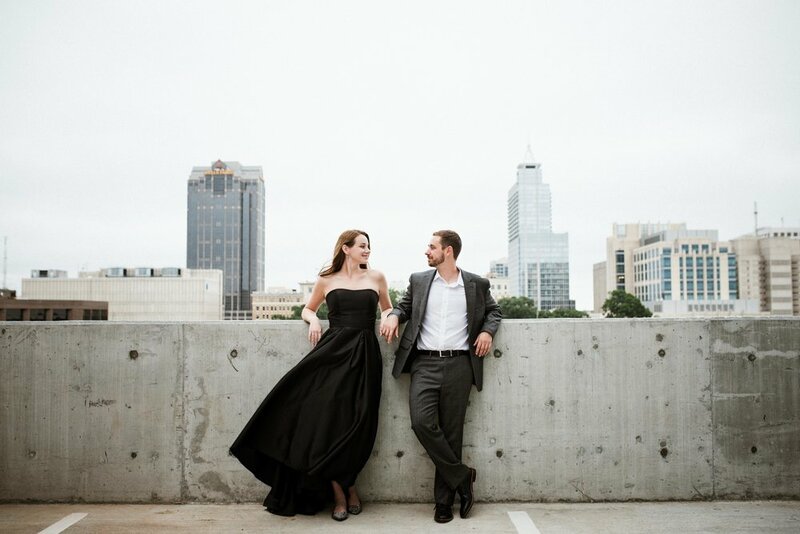 Cameron and Devin’s engagement session was suave. They absolutely let their styles and personalities be the guiding star of this evening, and it was so much fun to shoot. When we were planning this shoot, Cameron communicated to me their vision for their outfits—sleek, classy, and formal (very James Bondsy). With the desire to situate them in settings that were cohesive with their apparel, we chose the heart of the city, specifically Whiskey Kitchen and their outdoor and indoor bar setting as well as some newly constructed buildings that show off the city’s skyline. All things sweet, silly, with a flare of dramatic affect was our game. We sipped bubblies, took about four elevator rides, attempted to save an injured bird, and danced in a parking deck. These two absolutely love dating each other. Hanging on each other’s arms was natural and right. Their class and flare, both different, complimented the other’s perfectly, and I cannot wait to capture all their swag and style on their wedding day!